Thousands of people are reported to have gathered in Athens to protest against the country’s austerity deal, leading to teargas being thrown by police. POLICE AND PROTESTERS have clashed in Athens and the Greek Deputy Foreign Minister has resigned in the wake of the latest news about the country’s bailout deal. The Guardian reports that Deputy Foreign Minister Mariliza Xenogiannakopoulou has resigned. Greece’s Etathimerini reports that Transport Minister Voridis, Deputy Merchant Marine Minister Adonis Georgiadis and Deputy Agriculture Minister Aster have also resigned after the leader of their party, LAOS, Georgos Karatzaferis said he wouldn’t support the loan agreement. 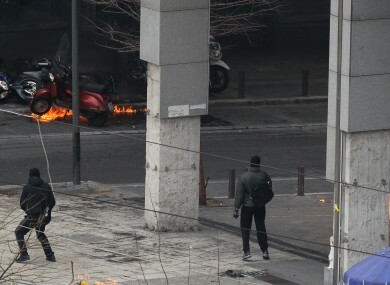 Meanwhile, rocks and petrol bombs were thrown at police by protesters in Athen, the BBC reports. Footage shown on Sky News showed large demonstrations taking place in Athens and Thessaloniki, with 20,000 people reported to be in Syntagma Square. Sky News cameras captured the police responding to missiles with tear gas. The protests come after a last-minute €130 billion bailout deal which came after seven hours of crisis talks. However, Eurozone leaders have withheld the bailout until new conditions are met. Greece needs the money to meet a bond payment on March 20, without which it will default. Reuters says that Greece’s biggest police trade union, the Greek Police Federation, said it would issue arrest warrants for the lenders for “subverting democracy”. It said that two officers have been injured in the clashes and three protesters have been arrested. Email “Greece: Clashes in Athens, ministers resign”. Feedback on “Greece: Clashes in Athens, ministers resign”.